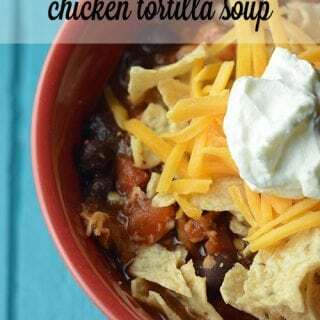 Crock Pot Chicken Tortilla Soup - Recipes That Crock! 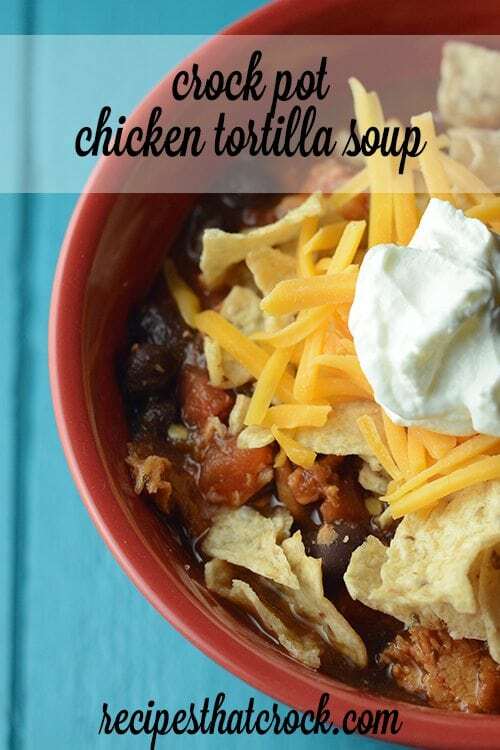 Are you looking for a great Crock Pot Chicken Tortilla Soup recipe? Look no further! This great recipe will have your slow cooker simmering in no time! Chilies, black beans, lime juice and much,much more make up the flavors in this delicious Crock Pot Chicken Tortilla Soup from Gooseberry Patch’s Slow-Cooker Christmas Favorites. The base of this dish starts with Diced Tomatoes with Lime Juice and Cilantro. Now, truth be told, I am not personally an uber-fan of cilantro. But I use this blend of tomatoes all the time in my Mexican dishes and just love it! Add to that some Salsa, Tomato Sauce, black beans, chilies and you will soon have a party in your bowl. Oh and you can’t forget the chicken! Ole! Speaking of chicken, about 6 hours into the cooking time (we love this crock pot for this recipe because of the adjustable time and alarm), you should remove it from the slow cooker and shred the chicken and return to the slow cooker. I toss my chicken into my Kitchen Aid Mixer. I turn on the mixer and it instantly shreds the meat! This is the perfect dish to serve up guests with a toppings bar… cheese, sour cream, crushed tortilla chips and maybe some salsa, fresh chopped cilantro and maybe even some cooked corn- yum! Ellen's Tortilla Soup from Gooseberry Patch’s Slow-Cooker Christmas Favorites. Put your chicken in your crock pot. Add your chilies and tomatoes to the crock pot (juice and all). Add your beans (drained and rinsed), tomato sauce and salsa on top. Cover and cook on low for approximately 8 hours. If made with chicken, removed the chicken breasts during the last two hours, shred with two forks (or your mixer) and return to your crock pot. Serve in bowls with preferred garnishes.